Full canvas covered aft deck with windows leading to the wheelhouse. The wheelhouse saloon makes for convivial cruising & is ideal for entertaining and dining while enjoying good views of the scenery. Dinette converts into a double berth (120x190). Heads and shower room to port side. Forward to the fore peak cabin with double berth in V shape (280x180) and a reduced headroom of 1.65 only. Instant gas hot water system. There is room for a black water tank if necessary. Ex fishing boat transformed to a live aboard for sale in France. 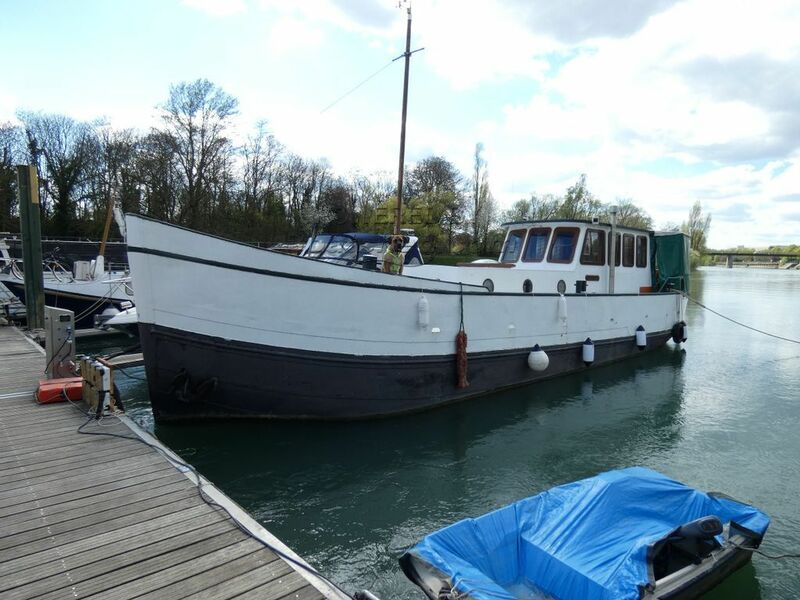 Boatshed Paris is happy to offer this converted Dutch MFV for sale in Paris area. Built in 1929 in the Netherlands for costal fishing, this boat has been completely refurbished and fitted to allow a couple to live comfortably. Ideal if you're looking for something different, functional yet comfortable & cozy with all the essentials on board. Situated in the East of Paris in a quiet port, could be ideal for a Paris home or a pieds-a-terre with the possibility of cruising too. Mooring could be transferred under port agreement. Last antifouling in 2013 (blackened hull under water line, and bi composant HEMPEL for the superstructure. For more information, or organise a visit, please contact, Pascal GAETAN your local broker at Boatshed Paris. This Dutch Steel Cruiser Ex Fishing Boat Converted has been personally photographed and viewed by pascal gaetan of Boatshed Paris. Click here for contact details.